Our team has been very busy since April. We have been intensively participating in the 32nd session of Human Rights Council, which adopted the historic resolution to mandate the appointment of an Independent Expert on SOGI. We also attended strategic meetings and conferences and developed interesting and useful research. As usual, we did a lot of work to strengthen and support the capacity of activists around the world. It’s time to sum-up ARC’s latest activities and share them with you, our friends and partners. 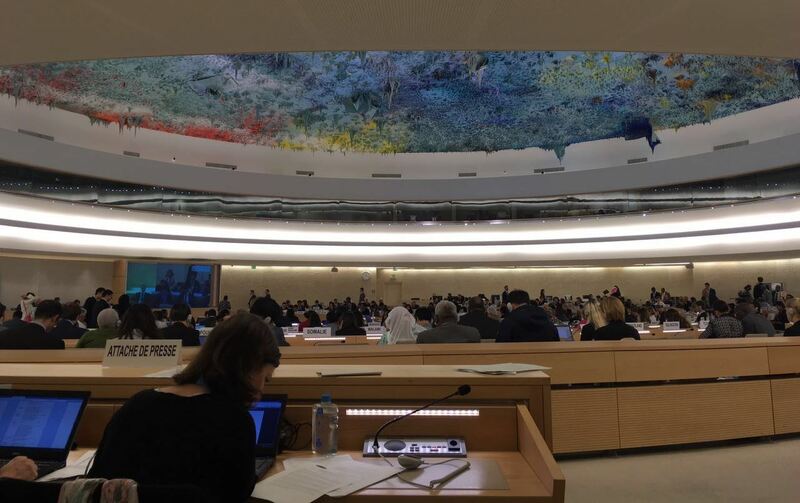 The defining event of the 32nd Session of the Human Rights Council was the passing of the resolution appointing an Independent Expert on Sexual Orientation and Gender Identity. The 2016 resolution, apart from being only the third resolution on SOGI at the Council, went several steps further and set in place a dedicated mechanism tasked with examining discrimination and violence on grounds of sexual orientation and gender identity over the next three years. The passing of the resolution will now ensure sustained and systematic attention by a major organ of the United Nations to violations on grounds of sexual orientation and gender identity. In this Report we examine and analyse the Resolution in all its facets, the process leading up to the resolution and the text of the resolution. The report is also an attempt to understand the political process i.e. why states voted the way they did. An underlying theme of the analysis is an effort to grapple with the implications of the resolution. Find more information on 32HRC. Is the language of SOGI adequate? In the context of a vigorous civil society debate on whether the language of SOGI is adequate and the need for a ‘wider’ framing in terms of sexual rights, Arvind Narrain did a piece titled “Sexual Orientation and Gender Identity: A Necessary Conceptual Framework for Advancing Rights?”. 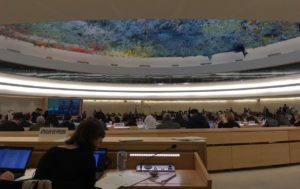 This piece was written in the context of the United Nations Human Rights Council debating the establishment of the first UN Independent Expert on sexual orientation and gender identity (SOGI). This piece evaluated what the conceptual framework of SOGI can accomplish and why a sexual rights framework while necessary would be inadequate in and of itself. This piece argued that we need to see SOGI and sexual rights as complementary and intersecting ways of framing violence and discrimination, with a victory in one sphere opening out the space in the other. Read full article. Lea el artículo en español. Lire l’article en Français. 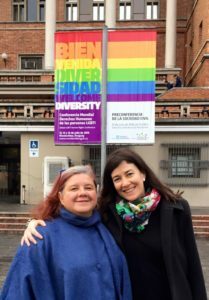 In the early part of 2016, ARC’s ED, Kim Vance, was invited to be part of a Working Group on International and Regional Diplomacy leading in to a government-led LGBTI conference in Montevideo, Uruguay in July. The working group met extensively prior to and during the conference, and drafted a strong analysis paper on recent achievements and challenges in the various regions, including recommendations aimed primarily at governments and donors. It was at this conference that a number of States announced the formation of a new Equal Rights Coalition and released their founding principles. It remains to be seen what the relationship will be between civil society and this coalition, and what it actually intends to do, but civil society at the meeting expressed cautious optimism and issued strong statements about its hopes and expectations of the governments who were members. 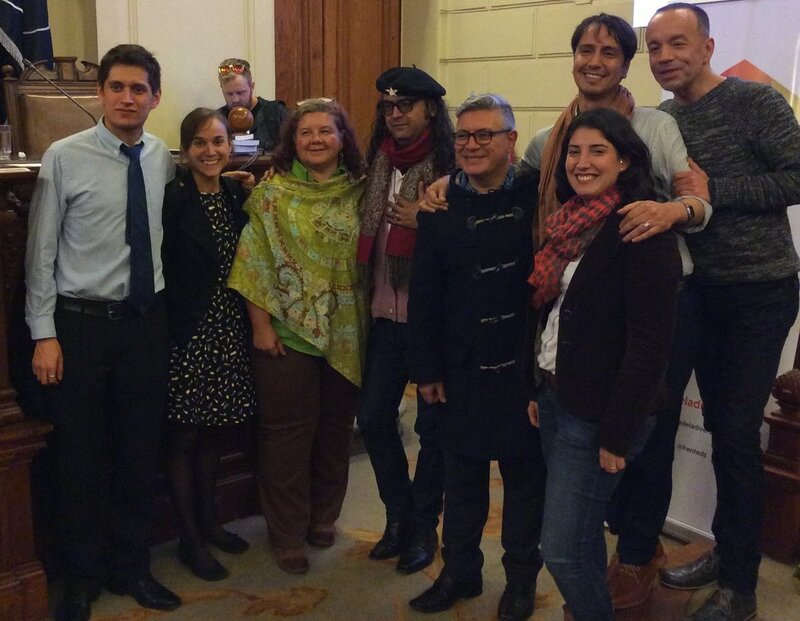 ARC also took advantage of the physical proximity of Uruguay and Argentina, to invite our Communications Officer, Mariana, to come over from Buenos Aires and participate in the civil-society pre-meeting leading in to the conference, as well as an additional meeting with parliamentarians. Our Communications Officer Mariana Winocur attended the “Seminar on equality and non-discrimination based on sexual orientation and gender identity for Latin American and Caribbean parliamentarians”, held in Montevideo and organized by Parliamentarians for Global Action (PGA) and the Parliament of Uruguay. The Seminar, which took place in the context of the Global LGBTI Human Rights Conference, was also an opportunity for the launching of the handbook Advancing the Human Rights and Inclusion of LGBTI People: A Handbook for Parliamentarians, a joint publication by UNDP and PGA which provides key information about human rights and concrete actions to raise awareness, examine, and reform the legal framework to address the needs of LGBTI persons. The meeting was an open dialogue between parliamentarians and LGBTI organizations and activists aiming at the possibility of thinking about actions that parliamentarians can take to advance the rights and inclusion of LGBTI people. In the end, and through the signature of an Action Document, PGA pledged to take concrete legislative and political actions to guarantee equal protection and inclusion of LGBTI people. 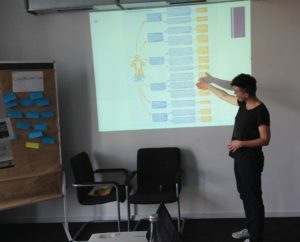 On 4 June, our Research and Information Officer, Dodo Karsay co-hosted a workshop at the 6th European Transgender Council, outlining how the UN can be a tool for trans rights advocacy. 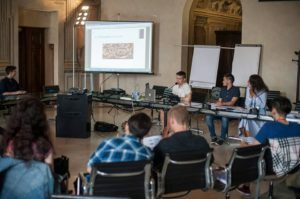 The workshop took place in Bologna, Italy at the bi-annual Council organized by Transgender Europe (TGEU). It built on TGEU and ARC’s toolkit Making the UN Work for You: A Toolkit on UN Advocacy for Trans Activists. It also looked at the practical impact of UN work through the examples of Russia and Kyrgyzstan. Dodo co-hosted the workshop with Kseniya Kirichenko, Director of Transgender Legal Defense Project (Russia) and Sanjar Kurmanov, Executive Director of the Public Union “Labrys” (Kyrgyzstan). ARC’s Geneva Director Arvind Narrain attended the “International Strategy Meeting: Advancing Women’s Rights and Gender Justice”, which took place in Mexico City, February 24-26. 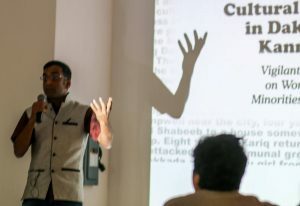 In the religious fundamentalisms conference Arvind presented a paper based on work in India on combating fundamentalism in the context of the infamous pub attacks on women in Mangalore in 2009. He counterpoised the idea of vigilante violence with the discourse of the principles and the visions underlying founding documents like the Constitution. In particular he excavated the idea of fraternity to add to liberty and equality to make the point that living together with deep associational ties is part of the founding promise. Hence vigilante violence on different ways of living is really not just a criminal law problem alone but fundamentally an attack on the values of the Constitution and needs to be treated with that sense of gravity. At the end of May/beginning of June, ARC’s ED, Kim Vance, was invited to attend and address the first ever Round Table on addressing Canada’s Role in Promoting International Human Rights. 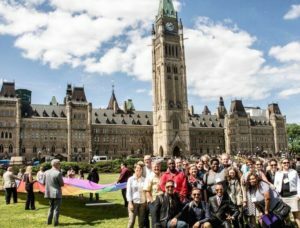 This Round Table was a unique opportunity to meet with parliamentarians and government staff, share the findings of two reports of the Dignity Initiative (a new Canadian NGO coalition advancing LGBTI human rights globally), and share information and strategize with Canadian-based civil society organizations on broad-based advocacy around global LGBTI human rights. 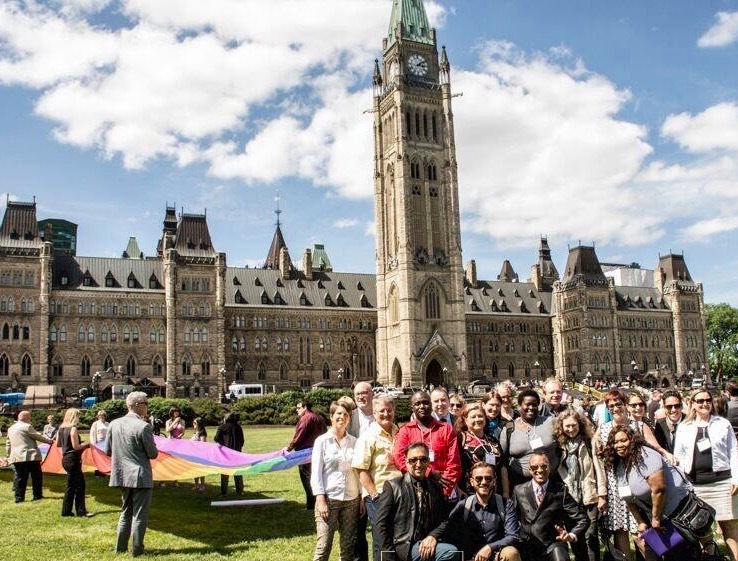 Not coincidentally, taking advantage of the civil society presence in Ottawa for this meeting, along with renewed commitment to these issues, members of the new Trudeau administration decided to host the first-ever pride flag-raising on Parliament Hill that went instantly viral on social media across the globe. It was an inspiring moment for ARC as a Canadian-based NGO. She was also invited to a lunch hosted by the Ambassador on “Multilateralism and LGBT rights in the Americas” with distinguished guests such as Judge Karen Atala, representatives of the Division of Human Rights, Chilean Ministry of Foreign Affairs, a member of the Red de Psicologos, and civil society advocates from Accion Gay, MUMS, el Frente de la Diversidad Sexual, and Todo Mejora. She also had the chance to visit the offices of OTD Chile and participate in a research session with trans advocates, as well as participate in a vigil and performance night in honour of Chile’s annual day of lesbian visibility. In May 2016, ARC, COC and PAI co-facilitated a very popular training on the UPR and other UN reporting mechanisms at a pre-conference to the the Pan-Africa ILGA conference that took place in Johannesburg, South Africa. There were participants from across the continent, including the MENA region, where three countries (Algeria, Morocco and Tunisia) will come up for review in the early part of the third cycle of the UPR. The conference also provided an excellent platform to discuss the linkages between local, regional and international activism, and the leadership of African civil society in advocacy around the call for a new UN Independent Expert on SOGI. There were also opportunities to engage with representatives of the human rights machinery of the UN and the African Commission, as well as the government of South Africa. We were also able to celebrate with activists from the Seychelles who were successful in their decriminalization advocacy while the conference was happening. 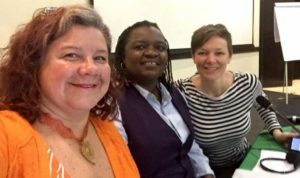 On a practical level, it also enabled ARC’s ED, Kim Vance, PAI’s new Coordinator, Monica Tabengwa, and Kenyan Judge Monica Mbaru to complete the final elements of their upcoming publication on “Human Rights and Traditional Values”. Our Research and Information Officer, Dodo Karsay joined TGEU’s training on Victim’s Rights and Hate Crime Monitoring and held a workshop to support trans activists in using the UN as part of their work against hate crimes. 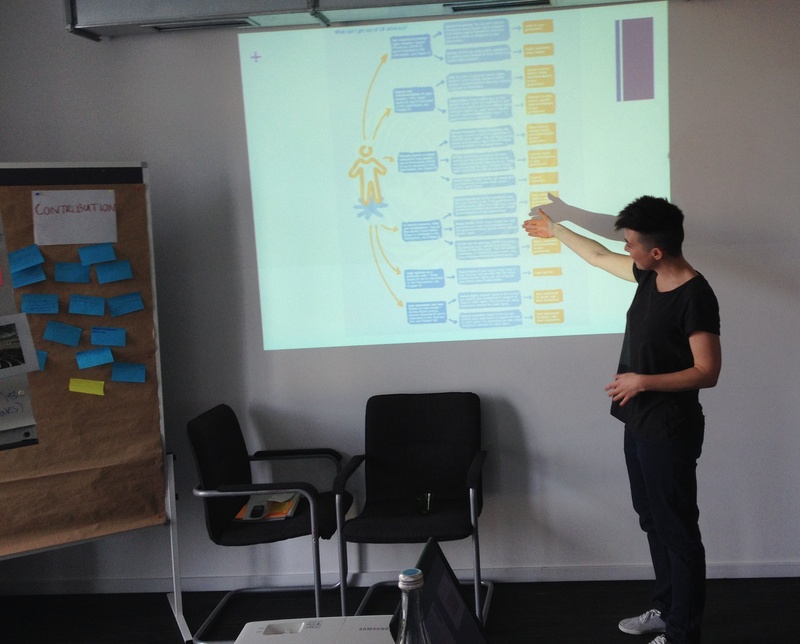 The training took place between 29 April – 1 May in Berlin and brought together activists from Europe and Central Asia. Dodo highlighted how the various UN bodies can be helpful for those working on monitoring transphobic hate crimes and shared information on how advocates can effectively engage with them. Our summary of what happened during the International Dialogue on the intersections of culture/tradition with human rights related to gender and sexuality is finally available and ready to be used either as a tool for advocating or as a memory of what had happened during the thrilling days the Dialogue took place. The Report is available in English, in Spanish, and in Arabic. From 19-22 February 2016 more than 60 activists gathered in Istanbul, Turkey from across the Middle East and North Africa (MENA) region and from across the world to join the Dialogue co-organized by ARC International and MantiQitna Network. This wonderful meeting aimed at building strategic regional and global alliances to address persecution, criminalisation and discrimination, not just in the MENA region, but across the world. It also allowed people to share experiences in advocating human rights related to LGBTI persons as well as to share best practices around addressing issues of religion and culture, and work more effectively at the regional and international level, with other organisations doing similar work. Transgender Europe (TGEU) and ARC’s joint toolkit Making the UN work for you – A toolkit for trans activists is now available online. Through its practical examples and reader friendly content, we hope that this resource will be a useful tool for activists who have never done any engagement with the UN or have limited experience. We encourage activists to use it and share it widely! The toolkit is based on the content of TGEU and ARC’s “UN Training for Trans Activists” that took place on 22-24 September 2015 in Geneva and brought together activists from 21 countries. ARC, ILGA World and the International Bar Association’s Human Rights Institute’s joint research project on the UPR and its impact is soon coming to a close. We would like to thank SOGIESC advocates who filled in our joint survey and participated in the interviews. We managed to gather valuable and rich data on civil society engagement over the two cycles, key trends in how SOGIESC issues have been raised by States, and the degree to which governments have implemented their UPR recommendations. The findings of the project will be jointly published later this year. Please follow our website and social media pages for updates! ARC continues to be part of the Working Group for the Observatory on the Universality of Rights (OURs) project which aims to monitor, analyze, and share information on initiatives that misuse religion, culture, and tradition to undermine the universality of human rights. In April, we were happy to participate in a communications effort to launch the on-line platform which can be found here. We will part of meetings and workshops at the AWID conference in Brazil pertinent to this topic, as well. ARC’s ED, Kim Vance, is pleased to be attending the 13th AWID International Forum in Sauípe, Bahia, Brazil, September 8 – 11. We will be co-presenting in a session entitled: Building an intersectional approach to women’s rights at the international level, and participating in numerous meetings, workshops and networking events. YP+10 The upcoming tenth anniversary of the Yogyakarta Principles presents an occasion to both evaluate how far the Yogyakarta Principles have taken forward the discussion on SOGI rights as well as identify gaps which need to be filled in the framework. In this context of gaps, we hope the YP can be provided with a textual supplement in the nature of a general comment with a view to covering concerns which the YP may not have reflected. We are pleased to announce that in a few days we will be having a renovated ARC Website. Our redesigned site will include, among other innovations, an author blog where ARC’s staff and/or guests will share their analysis and points of view regarding LGBTI issues. An interactive UN map will allow navigators to see each country’s Universal Periodic Review information as well as to know how each country voted on certain United Nations resolutions. Our new Webpage will highlight advocacy tools, will be more friendly to navigate and it’s being designed for responsiveness and integrity. ARC’s Communications Officer, Mariana Winocur, will be attending and presenting at the 4th Caribbean Women and Sexual Diversity Conference in St. Croix, US Virgin Islands in early October. This annual event is a fantastic example of a best-practice arising out of an ARC collaboration and partnership to organize an International Dialogue in Saint Lucia in 2012. In October, at ILGA Europe conference, our Research and Information Officer Dodo Karsay will be doing a workshop which aims to explain how the UN can be beneficial for LGBTI activism at the local or the national level. Dodo will be assisted by Arvind Narrain, our Geneva Director. ARC’s ED Kim Vance and Geneva Director Arvind Narrain will attend ILGA world conference in November. The meeting will present a chance to take forward reflections on what the Yogyakarta Principles have achieved as well as critically reflect on gaps in the YP and what can be done to ensure that any supplement to the YP reflect contemporary concerns.